We all know that smoking is bad for us, but how exactly does cigarette smoke do its damage? 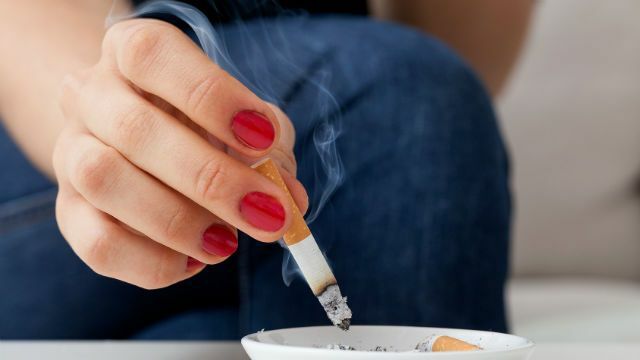 A new study performed at Uppsala University and Uppsala Clinical Research Center has found that smoking may cause genetic alterations that increase the risk for chronic disease. Through examining the genes of smokers and of non-smoke tobacco users, the research team found a significant number of altered genes in the smokers, but not in the users of non-smoke tobacco. This is not to say that non-smoke tobacco is safe. On the contrary, these forms of tobacco, including chewing tobacco, have been associated with increased risk of certain cancers, including mouth cancer, as well as tooth and gum deterioration. Besides numerous associations with increased risk of chronic disease, smoking may accelerate the aging process. As we reported in a previous article, in a comparison of non-smoking and smoking twin pairs, the twins who smoked had more mouth wrinkles, droopier upper eyelids, sagging lower eyelids, and were more likely to have jowls. Quitting smoking may seem like a very difficult feat. However, a healthy, whole, organic diet may do wonders in keeping cravings to a minimum. As we reported in another recent article, research has found that smokers who consumed a great deal of fruits and veggies found themselves less likely to smoke. This may be because the healthy foods increased satiety, and by some smokers, hunger is mistaken for cigarette cravings. Crunchy, healthy snacks, such as raw fruit and veggie slices, or raw nuts, may also help keep cravings at bay, since chewing them exercises jaw muscles and provides relief for some of the “oral fixation” that smokers crave. Whatever method you choose, a huge body of research plainly states that quitting smoking as soon as possible—preferably now—can do wonders for your current and future well-being. Next articleAre these 12 Things Hiding in Your Supplement? Hey Buddy!, I found this information for you: "Smoking May Have Negative Impact on Genes". Here is the website link: https://www.thealternativedaily.com/genes-affected-smoking/. Thank you.